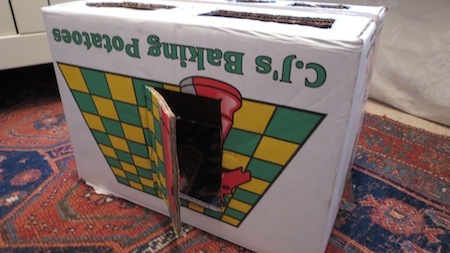 Here are some of our most successful homemade toddler toys made for our little girl. They have mostly been made out of recycled materials, took minutes to make, and provided (almost) hours of fun! My goodness, this was a success and it took me about 10minutes to make! Beanie was 16 months when we made this and was going through the developmental stage were she just wanted to post everything through anything....through doors, letter boxes, holes, under the fridge etc etc! 1. 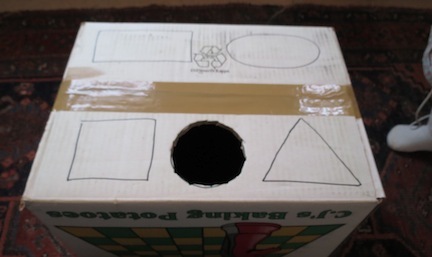 Draw different shapes on the bottom of the upturned box. Taking care use the knife to cut the shapes out. 2. Before I had cut more than one shape out Beanie was posting my camera wire through the first hole! This looked promising! 3. 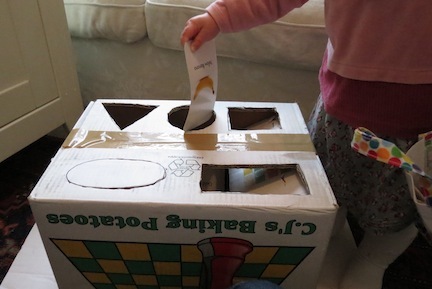 As more shapes were cut out Beanie went to her toy box and chose what she wanted to post into the box. 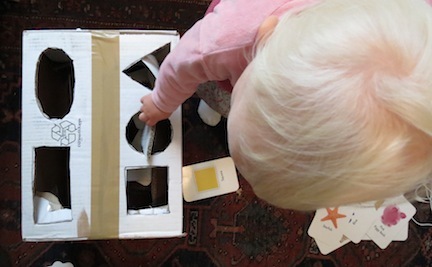 Here she is trying to fit her 'Brainy Baby' cards into the holes! 4. Once you have finished keep the cut-outs as they are great for posting and your toddler can try and match the shapes to the holes. 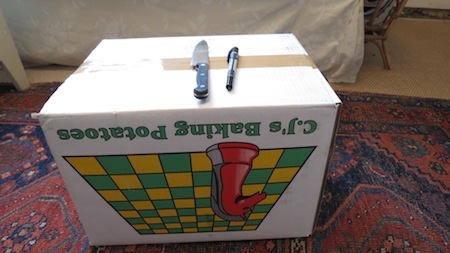 PS: I cut a door in the side of the box as 'door' is Beanie's favourite word right now. This is a great addition to a Posting Box as it can open and close! This homemade toddler toy is an easy and interactive way for your toddler to have fun and learn new words. 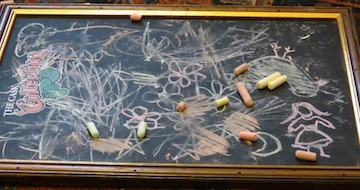 The idea comes from my brilliant neighbour who gave me the chalkboard when Beanie was about 14 months. It's come into it's own recently (17 months) and keeps her happy for a long time - scribbling and then wiping the board clean. It has also been a great way for me to interact with Beanie by drawing shapes and pictures and asking her what they are. A game she could do for hours! 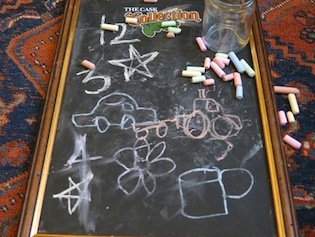 Let your toddler have fun with the chalks, before they have even drawn anything! 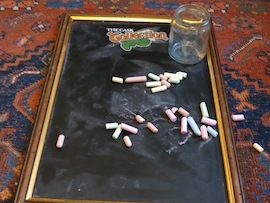 Beanie loves keeping her chalks in a jar and emptying them out and then putting them away. Often Beanie wants me to draw things and then ask her what they are. This is really lovely focused time together. I sit on the floor and we start with easy things. 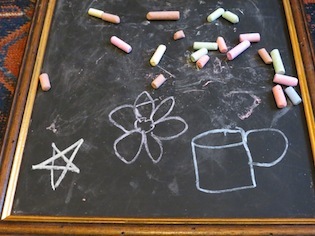 She now knows these objects - "star, flower, tea" before I have finished drawing them! The numbers 1-3, a tractor, a car..... all favourite words now at 18 months! And finally, wiping the board clean is as much fun as drawing things! 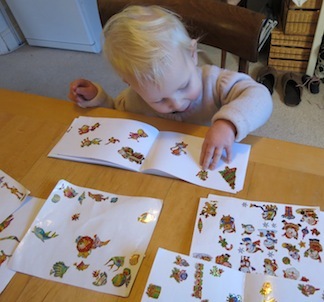 Stickers are one of the best homemade toddler toys to take out and about with you. They are compact, provide hours of focused entertainment, and are often reusable. 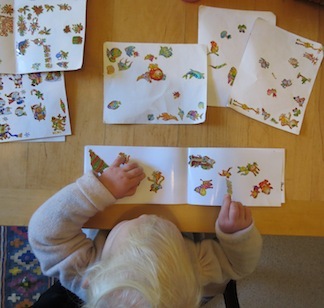 Recently we gave Beanie (19.5 months) her own little backpack filled with some books, crayons and stickers. She loves taking it out and about: on trains, in cafes, in church, and playing with the contents wherever we are. Sticker's especially have been a life saver!!! I buy a lot of the stickers from Poundland, a cheap UK store that sells everything for £1! Much better than the overpirced sticker books in the bookshops. Another option is to buy really cheap sticker shapes from a stationary store which can be peeled and stuck and then drawn over. Also, check out "kids sticker sheets" on Ebay (choosing lowest price and shipping). 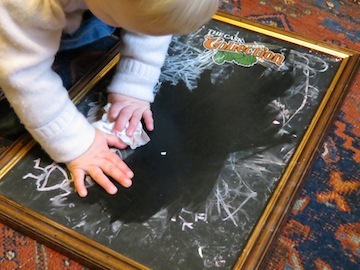 My experience is that toddlers simply like to peel things and are not bothered so much about the pictures themselves. 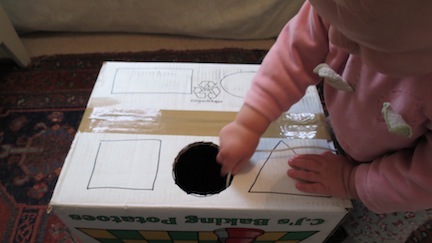 Check here again soon for more homemade toddler toys!